One of the best parts of being a design and build company is seeing our designs come to life. Because we come in with a fresh set of eyes and ideas, we are able to help homeowners envision an entirely new experience in their own outdoor spaces. Every project evolves as it is constructed, and it is rare that a design ends up looking exactly as it did on the plans. As things change on the jobsite, we are able to adapt and keep the integrity of the original design and as a result create a beautiful, cohesive finished product the homeowner loves to spend time in. The transformation of a site from the start of a design and build project to the day we finish construction is dramatic, especially when seen side by side. We recently had a chance to go back to a finished project and photograph it. We were so excited about the renewal of this space that we just had to share it with you. Originally, the homeowners contacted us to replace an outdated fence. The house was in a classic 1950’s style, but the homeowners were looking to bring a more contemporary aesthetic to their property. We were happy to fulfill this request, but as we began to build a relationship with the homeowners they asked us to help out with their backyard and driveway as well. We gladly did so. The homeowners were so pleased with our work that they contracted us to redesign their front yard too. What began as a small and simple project, developed into one of our favorite renovations. We were able to transform their generic, dated landscape into a beautifully modern, unique, and functional outdoor space. We kept the front yard simple. Planting, pathways, and a couple of walls were all we needed to give it a clean, modern feel. We created a welcoming atmosphere by adding a path from the street to the front door, rather than just the existing path from the driveway to the front door. 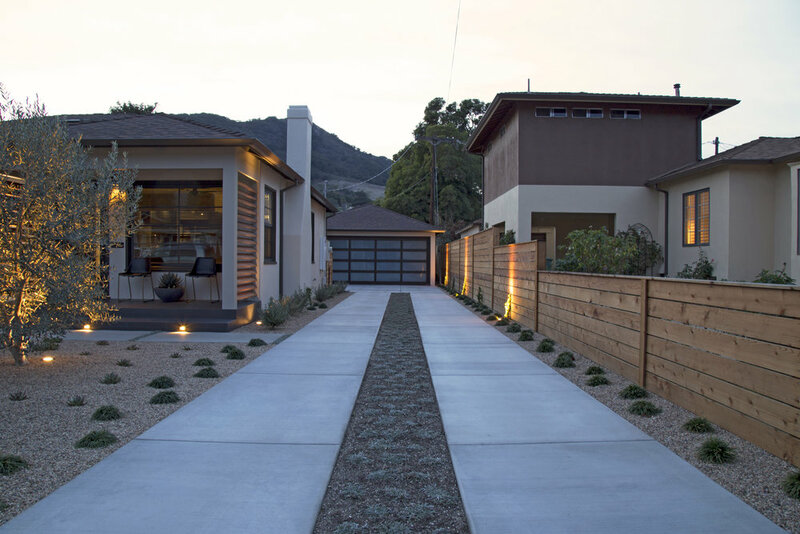 We installed two offset concrete walls to create a buffer from the street, without having to fence in the whole yard. The front porch was already covered, but we gave it a contemporary update with horizontal wood slat screens, angled to let in just enough light. The new screens complemented the black tile porch and the new dark finish of the window frames that the homeowner decided to install. Olive trees and minimalistic planting with palomino gravel mulch keep the subdued palette of the front yard. Path and accent lighting give the space life and warmth when the sun goes down. Looking around the side of the house to the driveway, we kept the essence of the mow strips, but once again gave them a modern update. We replaced the old, cracked concrete with wider mow strips to make them easier to drive on and to fill the space more effectively. Between the strips, we added a walkable groundcover as a low-maintenance and drought tolerant alternative to grass. Along the edges of the driveway, we used the same palomino gravel mulch and placed the plants in clean rows to match the planting style of the front yard and create a uniform look around the entire home. Horizontal mow strips at the garage create a larger space for easy maneuvering of vehicles and extra off-street parking when it is needed. The homeowners decided to replace their garage door, which was the perfect updated finish to the upgraded driveway. A stepped, horizontal wood fence provides privacy from the next-door neighbors and ties in the gate from the side yard as well as the screens on the front porch. The backyard went from bland to breathtaking. What was once simply a lawn, a few trees, and a storage shed became an inviting outdoor living space. Adjacent to the house, we created an outdoor living and dining area as a natural spill from the indoors to the outdoors. A built-in barbeque and dining table make it easy to cook and entertain on the patio and the adjacent intimate seating area fosters lively conversations among friends and family. We covered the concrete patio with a wood slat and steel framed pergola to continue the aesthetic from the front of the property and make the whole space feel cohesive. The pergola allows enough light in to make the patio comfortable on a winter afternoon, but provides enough shade to keep it cool on a summer day. A small, artificial turf lawn for the kids or pets to play on completes the immediate outdoor living area. At the back of the yard, we created a couple of destination spaces. The bocce ball court along the length of the back fence and fire pit with built in seating feel as though they are in a whole new space, yet are only a few steps away from the house. 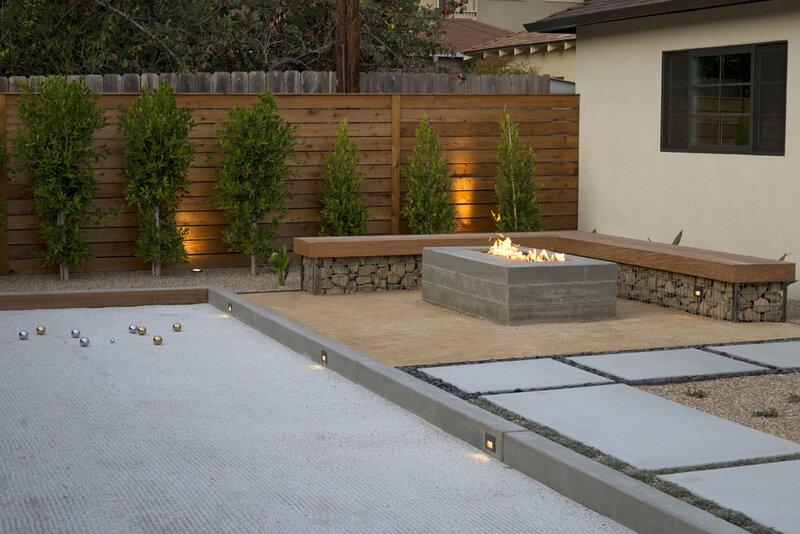 The concrete framed bocce court has low-voltage lights so the fun can continue well after the sun goes down. The concrete pavers surrounding the court are wide enough for a few spectators’ chairs and the fire pit has a great view of the action as well. The separation between the patio and the back of the yard makes the whole space feel much larger than it actually is. 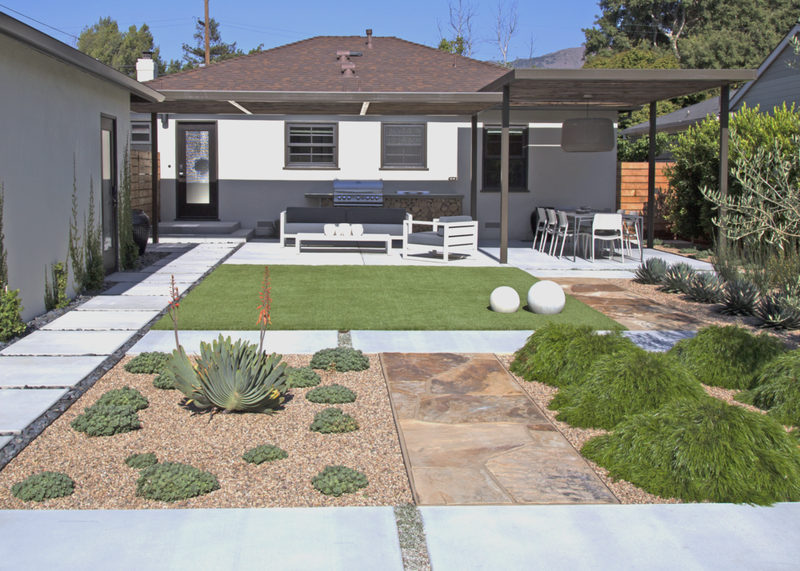 Linear pathways of concrete pavers with planted joints provide access to each of the spaces in the backyard. A few natural stone pathways add warmth and extra interest to the ground plane. Again, the palomino gravel mulch and elegantly sparse planting bring a cohesive feel to all the outdoor areas. What was once a home that no one noticed as they walked down the street has become a conversation starter. Many clients have seen this project on our website or noticed it when they drove by and want their own homes to have elements of this design. If you would like to see more photos of this, or other projects we have done, go the projects tab on our website. We strive to create spaces that people fall in love with, so if you like what we do give us a call to get started on your home today! I’ve always had a thing for wildflowers; they’re my favorite sign of spring. I love driving along the country highways this time of year, windows down and taking in the unmistakable scent of lupine lining the roadside, or hiking Valencia Peak in Montaña de Oro State Park and collecting flowering species along the way to create my annual coastal bouquet. Each year I complete the trek with a fist full of Indian paintbrush, yarrow, lupine, California buttercup, sage, poppies, California Indian pink, sticky monkey flower, blue dicks, California morning glory and others, and every time it makes for a captivating floral composition. I've also spent spring weekends in the California desert, just to take in the incredible display of inflorescence; a profusion of tiny, electrifying signs of life, somehow thriving in an otherwise desolate landscape. There's nothing that can quite compare to the contrast of stark, dry, sandy expanses interwoven with a colorful tapestry of wildflowers. It could be a single mariposa lily among the sagebrush, a little patch of Johnny jump-ups, baby blue-eyes or shooting stars, or a Figueroa Mountain hillside covered with fluorescent California poppies; it doesn’t really matter. There’s something about the short-lived burst of beauty and color that evokes an even deeper sense of appreciation for Mother Nature, with her intertwined systems that constitute this amazingly complex environment that surrounds us, varying hour to hour, day to day, season to season and year to year. This spring, as I’m sure you’ve heard (and have probably seen photos of by now, many times over, maybe even from space), the Carrizo Plain in southeast San Luis Obispo County is experiencing a rare super bloom, thanks to our first wet winter after several years of severe drought. A couple of weekends ago, I ventured out to the Carrizo Plain National Monument to experience the super bloom in person, and it was well worth the trip. The Temblor Range sets a perfect backdrop for the valley floor, with its southwest faces aglow with hillside daisies, just like they’ve been heavily marked up with a highlighter. Upon entering the monument the concentration of wildflowers intensifies, and by the time the road reaches Soda Lake, masses of hillside daisies, tidy tips, and fiddleneck form a never-ending sea of yellow, only interrupted by the occasional punch of purple from a cluster of valley phacelia or recurved larkspur. All throughout the valley, swaths of vibrant blooms wear petals of golden hues, creating carpets of sunshine, blowing in the breeze for a brief moment in time before they’ll melt back into the earth to rest up for next spring’s show. If you don't want to miss out, don’t put off your visit any longer; according to the Theodore Payne Wildflower Hotline (an excellent resource with weekly wildflower updates throughout the state of California), the peak has passed and the flowers are quickly beginning to fade. If you haven't already, get out there and appreciate this beautiful world where we reside... it's never too late to celebrate Earth Day! Every spring, HGTV selects stand-out outdoor spaces created by talented designers and builders from across the country, and showcases them as part of the HGTV Ultimate Outdoor Awards. When we were contacted by HGTV in December and encouraged to enter our work for the 2017 competition, we didn’t think much could possibly come of it; this is a nation-wide competition, and our new little firm’s portfolio can’t compare to those that have had the time, exposure, and resources to take on the impeccable projects typically featured on the well-known website. Despite our odds, we loved that they’d reached out to us, so we decided to go for it. We perused the categories to find the right fit: Gorgeous Gardens, Curb Appeal, Outdoor Escape, Outdoor Architecture, Art of Outdoor, and Water + Design. We spent a few minutes on the submission form, added a handful of photos, and voila! The art studio we built for a client last year was entered in the Outdoor Architecture category, and we shifted our focus back to the day-to-day of starting up a small business, with no expectation that we’d be hearing any more from HGTV about the competition. Our art studio, featured on HGTV! We were fairly surprised when we found out a month later that we’d made it through the first round, but we were completely shocked when we were notified in February that our project was nominated as one of the six finalists in our category. Now here we are, with our art studio displayed among some truly stunning spaces, all vying for the top spot as a panel of judges and the public alike vote on their favorites in each category. We’re so thrilled and honored to be a part of this competition, and we’re incredibly impressed by the caliber of work that is being generated in our field. Please visit the HGTV Ultimate Outdoor Awards website to view all of the spectacular landscapes (including ours! ), and cast a vote for your pick in each category, once a day through April 11th. We appreciate your support, and we can’t wait to hear the final results! Fancy the art studio featured in this story? Check out our fully-customizable outdoor Dwellings: The Simpleton (look familiar? ), The Cube, and Open Arms. Get in touch to get started on yours today! Nestled in the hills above the Environmental Horticulture Science Unit at the north end of the Cal Poly campus in San Luis Obispo, a stunning five-acre display garden secretly sits, tucked away from student traffic and hidden from view. I visited Leaning Pine Arboretum last week, for the first time in years, and an immediate sense of nostalgia arrived just as I did. After endless hours spent wandering through its winding pathways, welcomed by weeping boughs and mesmerized by back-lit blooms, this magnificent place holds a truly special place in my heart. Over fifty years ago, Leaning Pine Arboretum was established as a two-acre collection of various tree species, which was developed into the existing five-acre botanical garden by long-time arboretum director Tom Eltzroth. He contributed his extensive horticultural knowledge with enthusiasm, led fundraising efforts, created information tools including signage and a website, and implemented sustainable gardening methods. After over forty years with Cal Poly and eighteen years as the director, Eltzroth retired in 2008, and the arboretum is now managed by (my former arboriculture teacher) Chris Wassenberg. Leaning Pine Arboretum is constantly putting on an ever-changing show of foliage and inflorescence, attracting beneficial and pollinating insects, wildlife, and people alike. The garden contains hundreds of plant and tree species, mainly natives to the five Mediterranean climate regions of the world, which are well-suited for our California landscapes. Plant collections from Australia, South Africa, Chile, the Mediterranean, and California are all featured in the arboretum, alongside a New Zealand Garden, Formal Garden, Palm & Aloe Garden, Dwarf & Unusual Conifer Garden, and a Primitive Garden. Since its inception, the arboretum has been used as a living laboratory; horticulture, botany, forestry, and entomology classes all utilize the garden as a hands-on outdoor classroom, embracing the Cal Poly motto, Learn by Doing. During my time as a horticulture student at Cal Poly, Leaning Pine Arboretum was where I memorized a never-ending list of Latin plant names and learned how to properly climb a tree with gear; where I sucked up tiny insects in an aspirator to identify for my entomology collection and sharpened my chainsaw skills; where the Adirondack chair I built in my landscape construction class was placed, and still sits to this day (eight years later), a bit worn and weathered but steadfastly providing a place for visitors to rest and become enveloped and enchanted by the botanical world around them. The olive grove anchors the Mediterranean Garden. Besides functioning as a learning space for students, the arboretum is a valuable resource for community education and recreation. Self-guided tours by brochure or by cell phone are available, and organizations can arrange for a guided tour by an arboretum staff member. For those looking for a more informal experience with the garden, they can simply meander along the blue-grey decomposed granite walkway that loops through the property, connecting the plant collections and gathering spaces. There are signs positioned to direct visitors through the arboretum, and plant varieties are individually labeled in each section. Seating areas are scattered throughout the five acres, including a semi-circle stone bench in the California Garden that wraps around a fire pit and boasts breathtaking views of Bishops Peak and the surrounding hills. A gazebo abuts the picnic-perfect lawn area, and a built-in BBQ can be found right inside the arboretum entry. Leaning Pine Arboretum is an ideal place for a peaceful stroll in solitude or an afternoon nap in the sun, photographing flora and fauna, a weekend outing with friends and family, finding inspiration for your own space, and so much more. It's open to the public year-round and fee-free, so there's no excuse not to take advantage of this local beauty! Check out http://www.leaningpinearboretum.calpoly.edu/ for more information on the plant collections, horticultural practices used in the garden, and visiting the arboretum. Here at Landwell we love searching for design inspiration; sometimes that entails a flight across the globe, other times all it requires is taking a walk around our wonderful little city of San Luis Obispo. In the last couple of years one less-alluring section of town has truly grown on us, and it has become a favorite and frequented spot for refreshing our creative vision, along with a glass of wine. Just south of downtown SLO is an industrial area, speckled with historic remnants of the era of highways and railroads. This stretch of mid Higuera Street between Marsh and Madonna might not look very inviting at first glance, but there are a couple of gems that are definitely worth a visit. First stop, The Station. At the corner of Walker and Higuera Street, an old 1920's service station that hasn't pumped gas for 35 years has been completely transformed into a polished wine bar and gathering space. The run down, vacant building got a total face lift inside and out after the new owners (who also own Granada Hotel & Bistro downtown) bought it a couple of years ago. It was renovated and restored to retain as much of the original architecture and character as possible, and the result is quite charming! Hesperaloe, sedum, senecio, agave, etc. Upon arrival, it's pretty much impossible not to immediately notice the beautifully planted parking strips, brimming with different succulents of all forms, textures and colors. The Station Wagon is usually parked out front as well; a mint green mobile version of the shop in food truck form, with a vintage vibe to match. The entry is protected by the overhang that once sheltered gas pumps, and just inside is a welcoming and knowledgeable host, local marketplace goodies and shelves stocked with wine bottles from all over the world. In the adjacent room, window-filled garage doors let lots of natural light into the space that once was the mechanic's garage, illuminating the exposed brick walls and large wooden bar tables. In our temperate Central Coast weather the doors can be rolled up for fresh air and easy access during events. The Station hosts a variety of functions including Art After Dark, several food and wine classes, craft workshops, food truck nights and a pop-up paint and sip program called Art Bar. Even when there isn't an event taking place, The Station is a unique and worthwhile stop to fuel up with wine, bubbly or Root Elixirs soda with spirit, one of our local favorites which you can taste on tap or fill a growler to go! Just down the block on Walker Street is another diamond in the rough, Appendage + Bough. This funky barn-shaped building may be in an obscure location, sitting askew at the corner of Walker and Pismo Street, but its corrugated metal siding and bright turquoise paint job can't be missed, and what's inside shouldn't be either. The shop contains an eclectic mix of locally made home decor and gifts, clothing, jewelry, vintage finds and skillfully handmade furniture. 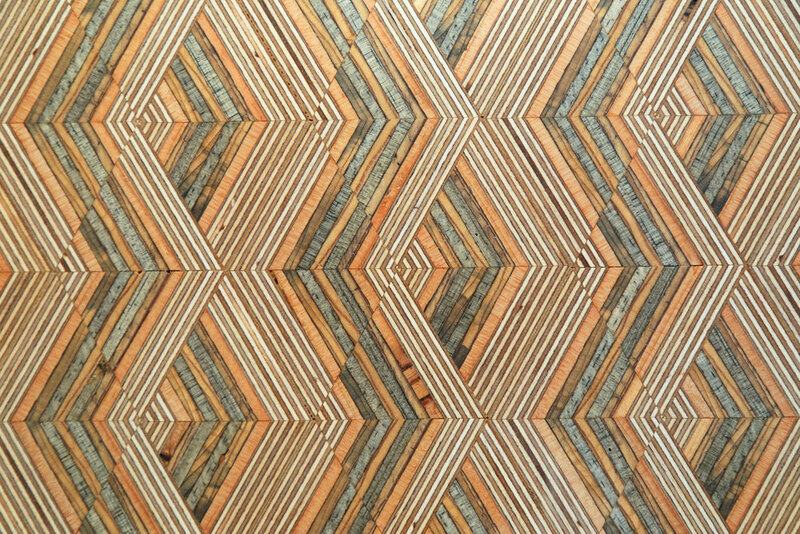 The two talented owners Tim Beebee and Ryan Ratzlaff (both hobbyist-turned-professional builders) utilize reclaimed materials, lumber milled in-house, and swap meet treasures to create custom tables and more, for the store, online shop and for commissioned projects. Their truly one-of-a-kind pieces are impeccably finished, while maintaining a rustic retro aesthetic. A newer addition in the tiny front showroom, meticulously crafted furniture and decor items by If You Give a Girl a Saw (owned by woodworker Janine Stone) and Mikey Gaumann are sure to impress with geometric shapes, clean lines and incredible detail. The pieces feel simultaneously modern and timeless, and that's right up our alley. We recently attended an opening at Appendage and Bough for the duo and won a gorgeous set of hexagon coasters. Best raffle prize, ever! Dropping by A + B during an Art After Dark artist reception, or one of their other lively gatherings? Be prepared to be welcomed with a toasty campfire out front, a glass of wine or a beer, and lots of local love. As a small new company in San Luis Obispo, it's inspiring to see this collection of brilliant, creative and determined entrepreneurs, sharing spaces and supporting each other to make big things happen, and improving our community while doing so. On top of sharing their craft and talent, these businesses are drawing attention to buildings that have been forgotten and changing the way we perceive them; bringing new life to what once was, pushing through challenges to pay homage in a current context. The perfect combination of old and new. It's encouraging to witness the beginning of the revitalization of a historically valuable area of our city, especially one with such proven potential. We hope the trend to restore and enhance mid Higuera Street continues, and we can't to see what pops up here next! For an interesting read, check out the Mid Higuera Street Enhancement Plan and learn about what the City of San Luis Obispo had proposed for this area back in 2001. I've been dreaming of visiting Iceland for years; drooling over photos of massive waterfalls and expansive black sand beaches, wondering what it would feel like to set foot on the largest glacier in Europe or sit in a geothermal pool under the Northern Lights. I was lucky enough to take a trip there recently, and this magical little country exceeded my expectations in every way. If there was ever a place to be reminded of how majestic and extreme Mother Nature can be, Iceland is it. It may be known as the Land of Fire and Ice, but for me it became the land of so many other spectacular things as well. In Southeast Iceland, Jökulsárlón Glacier Lagoon sits between a tongue of Vatnajökull Glacier and the North Atlantic Ocean. This glacial lake hosts hundreds of icebergs in all shapes, sizes and shades of clear blue, broken off from the base of the glacier and bobbing around, slowing making their way to sea. Adjacent to the lagoon is Diamond Beach, where hundreds more of these huge ice chunks can be found, washed ashore and sitting like giant crystals on the black sand. I was completely mesmerized by the way the light refracted through the ice, revealing different reptile-like patterns as the waves crashed and swirled around the bases of the car-sized icebergs. The contrast of the illuminated ice and the black sand was striking, and I could have spent days photographing this one spot alone! To say that Iceland is abounding with beautiful scenery is an understatement. Around every turn is a view more breathtaking than the last; dramatic vistas of glaciers spilling out between snowy peaks next to lava fields that carry on for miles, followed by rock arches jutting out into the ocean and towering over endless black sand beaches. The landscape is ever-changing, and driving five minutes down the road makes you feel like you're on an entirely new planet. The Ring Road in Iceland is a continuous loop around the perimeter of the country, and driving a little less than half of it during the trip opened my eyes to Iceland's bountiful diversity... significantly more than I've found in any one place before. You can't go far in Iceland without seeing an indication of the incredible amount of past and present volcanic activity there. Lava fields, beaches of black cobble, and cliffs of basalt rock columns are abundant. Dormant volcanoes rest under glaciers, with signs of their existence miles away in the form of underground lava tubes, formed by cooling magma hundreds of thousands of years ago. Vatnshellir is a multi-chamber lave tube cave created by the Snæfellsjökull volcano, which inspired Jules Verne's novel Journey to the Center of the Earth. Taking a spiral staircase 30 meters into the earth, learning about the cave's formation, and experiencing complete darkness (literally) while listening to the water dripping onto the cave floor from the porous lava field above was certainly a once in a lifetime experience. Iceland may still be home to lots of ice and snow, cold temperatures and Europe's largest glacier, but that may not be the case forever if climate trends continue as they have. The Blue Diamond ice cave within the Vatnajökull Glacier will not exist next season, because the glacier is receding approximately 200 meters per year. It was surreal to hike twenty or thirty minutes up from the foot of the glacier, then step down inside something so extraordinary, knowing that next year that whole expanse of ice will be gone and no one else will ever get to experience that cave again. It was a stunning reminder of our immense impact on this planet, and the necessity of making a change to save these unique and irreplaceable places disappearing before our eyes. Iceland can be a harsh, unforgiving place in the winter, and at first glance it's unbelievable to imagine people and animals surviving in that kind of environment. Upon a closer look though, it's easy to see the ways that the population there has adapted to life in those *chilly* conditions. Icelandic sheep are the wooliest I've seen, and the horses are stout with thick coats, allowing them to stand out in the snow with freezing winds blowing 50-60 miles per hour. Churches are topped with turf roofs for insulation, and modest houses and barns with simple architecture are tucked into hillsides, earth bermed and disguised, shielded from the elements. Steaming geothermal springs have been tapped into to build an abundance of public baths with temperatures akin to hot tubs, so there's always a nearby opportunity to strip down and warm up! The concentration, variety and quantity of waterfalls in Iceland is mind-blowing. I must have seen more waterfalls in one week there than I had seen in the rest of my life leading up to the trip. Having a waterfall in your backyard there is not uncommon; every little farm house seemed to be perfectly situated at the base of a mountain, with multi-tiered falls cascading down the rock face above. Some of the more well-known waterfalls were so large and powerful that I found myself disregarding the less-magnificent ones, which is crazy considering how rare waterfalls are back home on the Central Coast of California. Share a little water with us, won't you?! Iceland is powered 100% by renewable energy, which the country has made possible by developing an extensive system for harnessing and utilizing their unique resources of geothermal and hydrological activity. During a visit to a geothermal power plant I learned that 85% of the homes in Iceland are warmed with geothermal heat, which is also used in greenhouses, fish farming, snow melting, hot water distribution, and the list goes on. I was so impressed by the complexity, breadth and efficiency of their energy network, and it gave me an even deeper appreciation for this remarkable country and the people who live there. When snow and hail, below-freezing temps and howling winds are the norm, there are bound to be a few things that don't go quite right. If you explore Iceland enough, you'll find evidence of that here and there. Two and a half miles out on a straight and seemingly endless trail of crushed black volcanic rock, sits the carcass of a US Navy DC-3 airplane that crashed on Sólheimasandur Beach in 1973 after experiencing severe icing. It's an eerie feeling to see the body of the plane, mangled but mostly intact, all by itself with nothing but ocean and black sand surrounding it as far as the eye can see. On the Snæfellsness Peninsula is another instance where wreckage has been left alone to be manipulated by nature; pieces of rusty iron from a British ship circa 1948 can be found scattered over the black beach cobble, and the contrast is utterly eye-catching. I can't count the number of photos I took of perfect reflections in Iceland. The calm water of lagoons, bays and fjords created mirror images of snowy mountains at sunset, glaciers and waterfalls, even the Northern Lights. This time of year days are short and the sun is so low in the sky, that the six hours of sunlight feels like a long sunrise blending seamlessly into a long sunset, and the result is continuous ideal lighting for countless photographs like the ones below. Standing in the stillness and encompassed by a pristine landscape definitely allowed me to do some reflecting of my own as well. Besides fewer tourists and cheaper accommodations, one main reason for visiting Iceland in winter is the chance of seeing the Northern Lights, a common item on many bucket lists including mine. Although I'd caught a glimpse of the Aurora out of the airplane window on the flight over, it wasn't until the last night of the trip that I got to see the Northern Lights dancing in the skies over Iceland. It was just as enchanting as I had imagined, waves of green and purple illuminating the dark night sky, constantly shape-shifting and showing off. It made for a fantastic ending to an unforgettable adventure, and I hope everyone gets to experience that same phenomenon at least once in their life! I could go on and on about this wondrous place that I fell in love with, although it's left an impression on me that I can't quite put into words. Until next time, Iceland! Welcome to the Landwell Design + Build Co. blog, Reside Outside! We'll keep this initial post short and sweet. We hope you'll follow along here as we share project updates, design stories from the Central Coast and beyond, product and material features, and inspiration from the built and natural environment. Stay tuned for our next post, coming soon!